I’ve been geeking out on Google Trends for the last 6 months or so. I devour almost every article that lands in my inbox. I take screenshots, run tests, and unpack what I learn so that I can teach or apply the information to my clients’ success. If you haven’t yet investigated or played around with Google Trends, be prepared to go down a very deep, but deeply satisfying rabbit hole. Trends is like Pinterest, but for data lovers. I’ll admit, this part of my personality caught me by surprise, but clearly the left half of my brain is enjoying diving into the data, seeing the numbers and following chart lines. When I combine the analytical left with the creative right, magic happens. I can see the immense opportunity for video in the pie charts, graphs and maps. Recently, I was conducting market research for a restaurant client offering Asian fusion. We wanted to create meal-specific videos, so I started with the very basic search around Asian food. What I was looking for in Google Trends is what people are searching for, what they are talking about and where they are. I drilled down Asian fusion and saw some startling results. 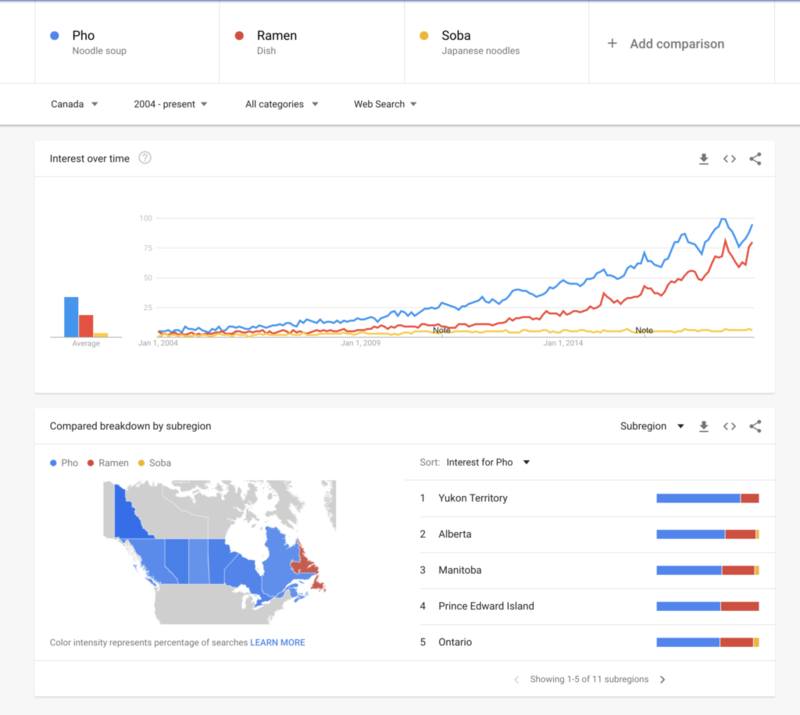 As a search term, Asian fusion has been steadily rising in Canada, except for Saskatchewan and Manitoba, where the number of searches about that topic is so low, Google cannot even capture a number. I dug even deeper, and eventually landed on searching and comparing three of the most popular Asian food offerings: Soba, Ramen and Pho. I pulled data from worldwide searches and from Canada, both with the timeframe of 2004 to the present. Soba has flatlined, whole Ramen and Pho are in a race for the top. What I was looking for was a regional lift in searches, and the data did not let me down. Since 2004, Alberta has been going Pho crazy, ranking below the Yukon (I did not see that coming! ), but above Manitoba, PEI and Ontario. I pulled the same data for the last 12 months to garner even more details. 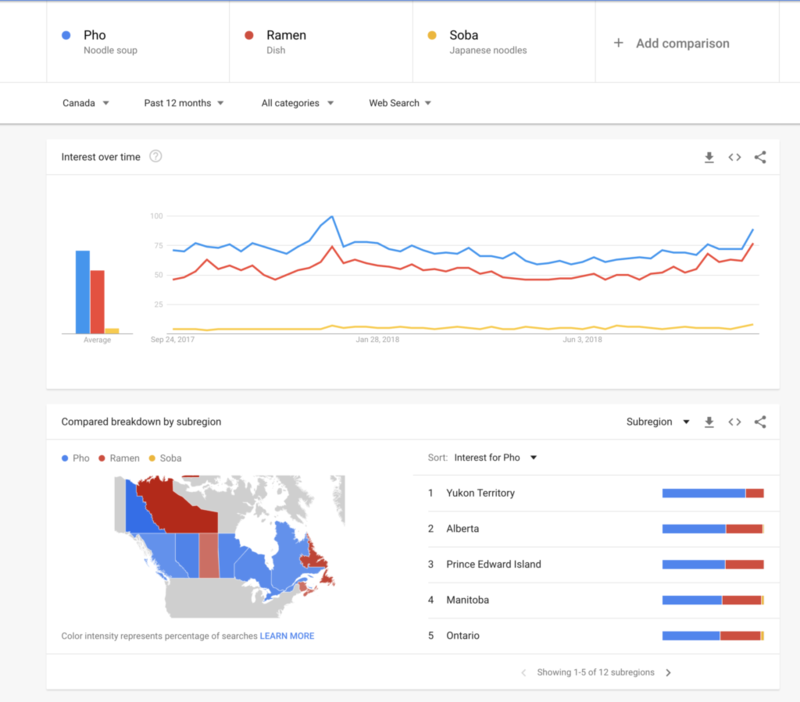 Over the past 12 months, Canada has placed second world-wide for searches related to Pho. 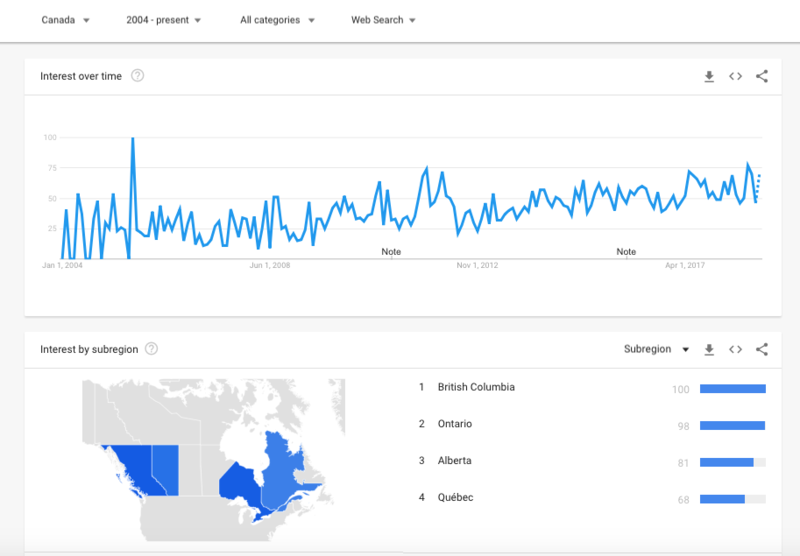 I can dig even deeper, searching by province, following the trail of top searches, searches rising in popularity, and build comparisons. 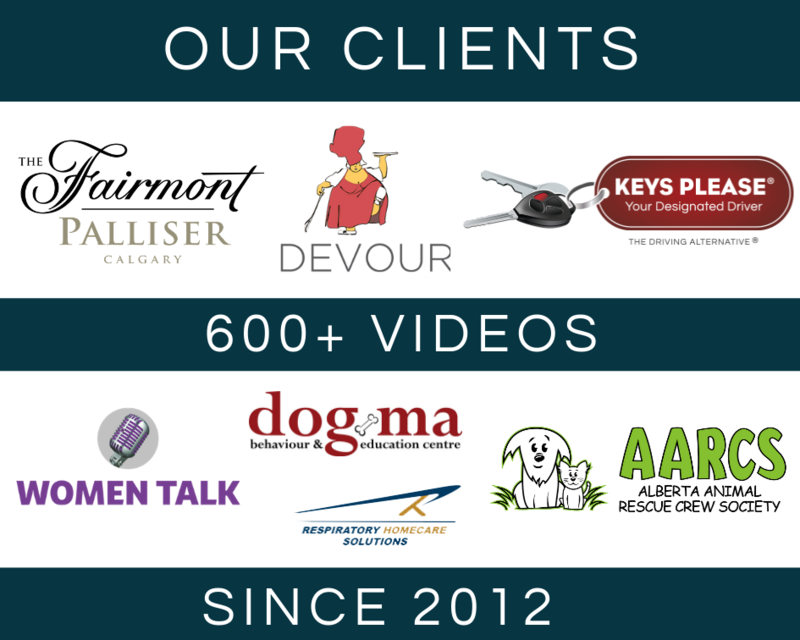 From all the research, the message was clear: creating videos around the subject of Pho was probably going to yield the results the client was looking for. Knowing what people were already searching for made it easier for me to build a strategy and develop a series of videos. 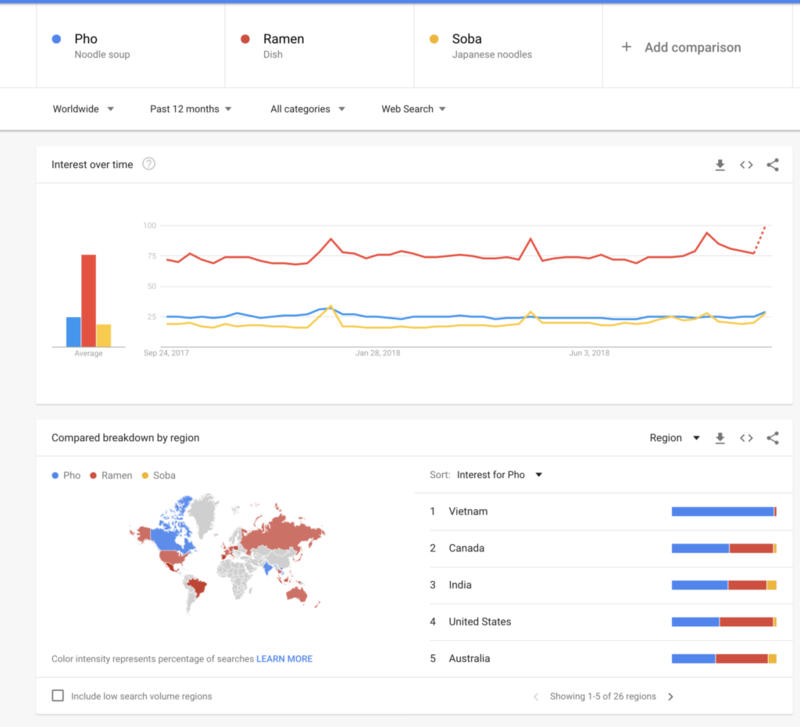 If you are curious about what people are searching for relative to your business, hop on over to Google Trends and start playing. There’s video gold in them there numbers. 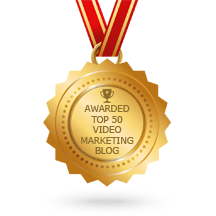 Next time on the blog: Using Think with Google to drive your video marketing.